A student loan servicer’s job might seem vague or mysterious when you first graduate from college. But it’s simply the middleman between you and the company that lent you money. That’s why getting to know your servicer is the secret weapon in the battle to get rid of your loans. Student loan servicers collect your student loan bills and keep track of whether you pay them on time. They also help borrowers switch repayment plans, certify for forgiveness programs, and sign up to postpone loan payments. Your servicer’s job is to help keep your loans in good standing by giving you the support and resources you need. If you have trouble working with your servicer, submit a complaint to the Consumer Financial Protection Bureau. Here are five ways your servicer can help you, and how to find out which company you’ve been assigned to work with. Servicers manage student loans on behalf of the federal government and private lenders. So while you may have a federal student loan, you’ll work with a private company to pay it off. Your servicer will contact you after the first federal loan is paid out to you. It’s best to register for an account on its website right away, so you can keep track of how much you’ve taken out and how much interest adds up while you’re in school. You can also use your online account to pay off the interest that has accrued before it capitalizes, or is added to your total balance at the end of the grace period. Once you graduate, sign up for automatic monthly payments so you’re less likely to fall behind. But be sure you have enough money in your bank account each month to cover the bill. 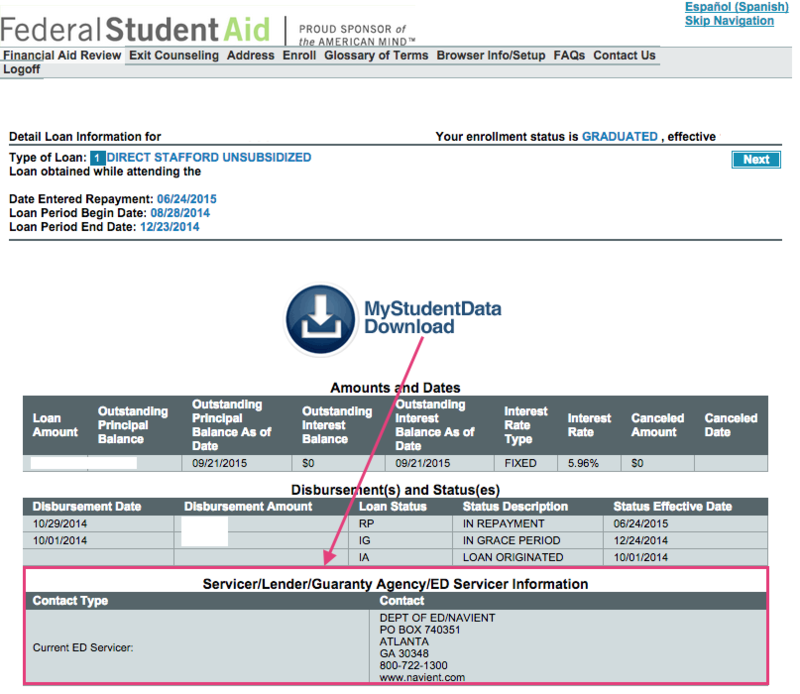 A full list of servicers is available on the Federal Student Aid website. Your servicer will place you on the 10-year standard student loan repayment plan unless you pick a different one during your exit counseling session around the time you graduate. The standard plan breaks up your balance into 120 fixed payments. But if you have a lot of debt that can be difficult to afford. Student loan servicers can help you figure out if you’re eligible for one of the government’s income-driven repayment plans, which cap your bills at a percentage of your income. See what you’d pay on an income-driven plan using the government’s repayment estimator tool. If you decide to switch, your servicer will process your application and annual income recertification, which you must submit to stay eligible. Once you start earning enough money to pay extra toward your loans, you might want to pay off certain loans first — like the ones with the highest interest rates, which will help you save money in the long run. Contributing more than your scheduled payment will reduce both your overall balance and the interest you pay over time, so kick in a little more than you need to when you can. Most servicers will let you target an extra payment toward a particular student loan on its online portal. You can also call, email or write your servicer a letter instructing it how to apply additional money. During your repayment term, there may be periods when you can’t afford your loan bill. Call your loan servicer to let it know as soon as you can. You can apply for deferment or forbearance, temporary postponements of your payments during periods of financial difficulty. Deferment will save you more money, since subsidized loans don’t accrue interest while they’re deferred. All your federal loans will continue to accrue interest during forbearance, but it’s a good option for borrowers who don’t qualify for deferment. Your servicer will help you determine which one you’re eligible for and how to get it. Public service workers, teachers and Perkins loan borrowers all have access to student loan forgiveness if they work in certain fields for a period of time. To make sure you’re on track to get the benefit, your servicer can help you determine whether your loans are eligible, whether you’re on a qualifying repayment plan, and whether you’ve properly filled out any certification forms. Applying for a student loan forgiveness program could mean changing servicers. The Public Service Loan Forgiveness program, for instance, forgives the remaining balance of your loans after you make 120 payments while working at a nonprofit or for the government. FedLoan Servicing manages the Public Service Loan Forgiveness program for the government, so once you begin the process of certifying your eligibility, your loans will be transferred to FedLoan Servicing if you don’t already work with it. Learn more about forgiveness options and how to apply. On May 10, 2015, the government introduced the Federal Student Aid ID. It replaced the FSA PIN, a four-digit number federal loan borrowers used to use to fill out the FAFSA and log in to other Federal Student Aid websites. Create a new FSA ID if you haven’t logged in to a financial aid website since then. Besides using your FSA ID to view your loan details, you can use it to apply for a direct consolidation loan or an income-driven repayment plan directly through the government. 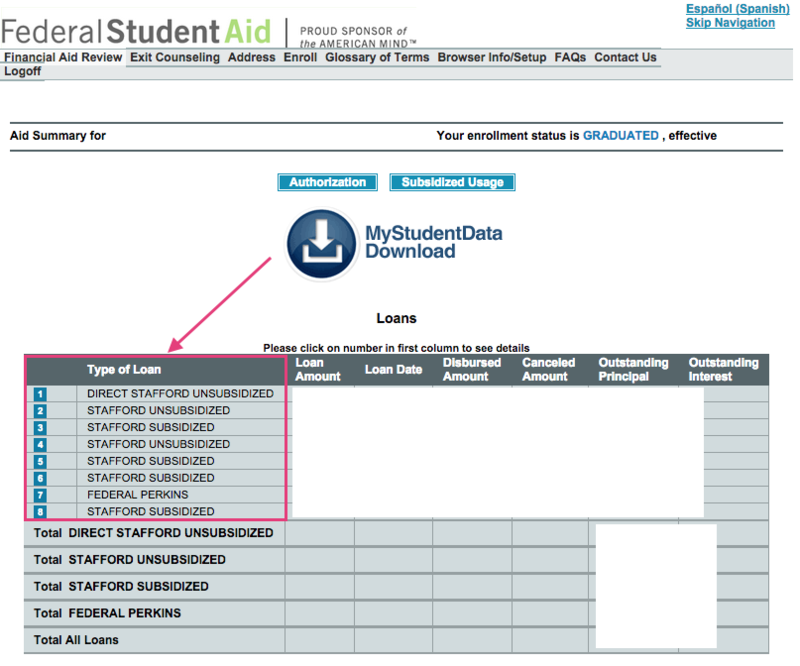 Once you create an FSA ID, you can view your loan details on the National Student Loan Data System. Visit NSLDS Student Access and click on “Financial Aid Review.” After accepting the site’s terms and conditions, you’ll be prompted to enter your FSA ID. On the next page you’ll find a chart, called your “Aid Summary,” which lists your loan types, amounts and the dates they were disbursed. Click on the numbers in the blue boxes, to the left of the “Type of Loan” column, to bring up more details about each of your loans. At the bottom of the page, you’ll see a box labeled “Servicer/Lender/Guaranty Agency/ED Servicer Information.” The company to the right of the label “Current ED servicer” is your student loan servicer. Knowing your student loan servicer’s name — and feeling comfortable contacting the company — is the first step toward getting ahead of your loans. This article was updated. It was originally published Oct. 13, 2015.